Upon the completion of the church building in 1892, a small organ was purchased that had no pipes. 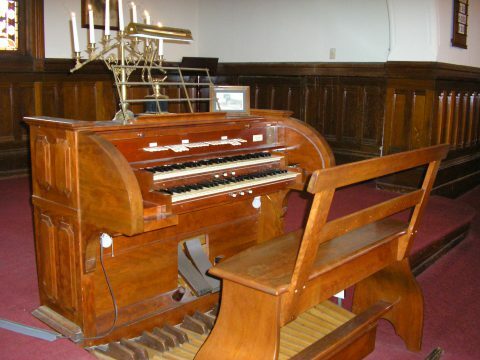 It was used until 1924 when the church invested in a new pipe organ manufactured by one of the most prominent organ manufacturers at the time, the Estey Organ Company. At the time the organ was purchased, the Estey Organ Company was one of the first and largest organ companies in the United States. It was founded in Brattleboro, Vermont by Jacob Estey in 1855, who had purchased the company from pioneer organ builders, the Jones Brothers in 1846. During the 1920’s, the pipe organ became the dominant product of the Estey company. During this period there were between 75 and 100 companies that were building pipe and reed organs in the United States. The firm was the only one in the industry that made every part used in its instruments. The Universalist minister of the Santa Paula church in 1923 was Frank L. Masseck. He had been a Universalist minister in Brattleboro, Vermont and was acquainted with some of the employees who worked at the Estey Organ Company. The church had an organ committee and they looked at other organs including the Smith organ which the church organist preferred. Reverend Masseck recommended the Estey Organ Company because of his knowledge of the company and the church ultimately decided to purchase the Estey organ and the rest is history!